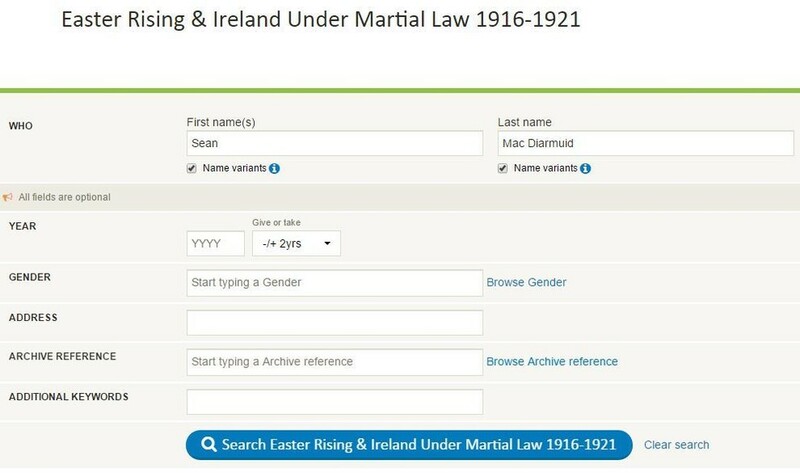 The incredible Easter Rising & Ireland Under Martial Law 1916-1921 collection contains over 75,000 records, ranging from riot reports to first-hand accounts. This once-classified set exposes the effect the Rising had on people across Ireland, including witness statements and urgent government communications, as well as 25,000 search and raid reports. When you start your search in the Easter Rising collection make sure to keep the search terms broad. Start with just a name with both name variants boxes ticked. It's important to bear in mind that while having a lot of information on your relative can be extremely useful for narrowing down results, overloading the search terms can hinder your search. For instance, simply adding in Sean's birth year + or - 2 years returns 0 results. By removing Sean's birth date from the search terms, we turned up 1 result. The Easter Rising collection differs from many other sets because the original documents are often lengthy reports of events rather than a document recording individual people. Because of this, details such as dates of birth are very often not recorded. If you enter a birth date but the transcript has it listed as "-", it will not return a result. As many of the people you will find in the records will have Irish names, they may appear in the collection under multiple different spellings. Making sure the name variants box is ticked will help in this case. Here, searching for Sean Mac Diarmuid has turned up a search result for Sean MacDermott. However some names can appear so removed from the spelling you know that they can't be found even with name variants. This is where searching with wildcards comes in handy. When you want to use a wildcard, select a character in the word you're searching and replace it with either an asterisk (*) or a question mark (?). Replacing the full name with Sean Mac* turns up results for any Seans whose surname begins with the letters Mac. In this way, we were able to recover one more entry for Sean, under the spelling of "Shean MacDiarmada". Searching the last name Folkes with a wildcard character in place of the letter L (Fo*kes) will return results that include last names Foakes, Fokes, Folks, Fookes, Forkes, Foukes, Foulkes and Fowkes. On the other hand, using a question mark instead limits the wildcard to just one character. It's best to use the * in most cases, but if you're sure that only one letter may be mistaken, you can narrow your results down a little bit by using the ? instead. For instance, if we think one of our Smith family members may have been recorded as a Smyth, we can use Sm?th instead of Sm*th.